Public forum of Land Rights and Street protest which was conducted on 11.02.2016 by People's Allaince for Right to Land (PARL). PA / NAFSO and MONLAR are Co - organizers of this event which held at CMU hall in Colombo. The objective of this event is " even if the government was changed , still people are unable to get their land as people expected by regime change. so people demand to release their land and demand the government to fulfill their election promises as given. Yahapalana Government came to power promising to solve the land issues among many other promises and showed that they are on the process after electing as the new government. on 11 th Feb 2015 released a cabinet paper deciding to release the lands belongs to Panama people which was grabbed by previous government using military. Even after passing one year to the cabinet decision, yet to release the Panama lands. PrimMinister Ranil Wicramasinghe Promised to stop port city project before he being elected and now he saying that it will be carryout as planned by the previous government. More than 700 people took part in the event today. Parliament member, Mr. .Jayampathi Wickramaratna and constitutional commission member also were present for event. we have handed over a collective proposal for the new constitution to the constitutional commission member. During the Forum , we specially highlighted the Valigamam , Kalpitiya, Irudeniyaya, Sampur, Mullikkulam, Pallimunai, Uma Oya , Port city and Pasikuda land issues where PA is engaging. The Forum was begun at 10.30 am and concluded around 01.00pm. after that people have come to the street and protest in demanding to release their land. After the forum people conducted a protest and people from all over the country where people have been facing alnd issues specially in Mullikkulam, Valigamam from Jaffna District, Mullikkulam, Sampur, Irudeniyaya, Monaragala people who affected by Uma Oya project, Matara, Galle, Kalutara, Gampaha, Puttalam, Kalpitiya, Polonnaruwa, Ampara from Ashrof Nagar , Pallimunai from Mannar District , Batticaloa and Badulla and Hatton were present. the leaders of each area were able to go to the Presidential secretariat and Prime Minister's Secretariat (Temple Tree) and handed over a petition to the relevant officials. The present Constitution of Sri Lanka does not recognise the right to property (including land), nor does it confer the status of fundamental right, to the right to adequate housing (see annexure). Citizens of all ethnicities and particularly the poor and marginalised, are subject to the violation of their rights. Women are discriminated against in comparison to men in statutory law and administrative procedures. Through legislative, policy, political and institutional failure, there is limited relief and redress available to those whose lands and homes have been removed, and/or are denied access to their property. During the conflict a large area of land in the Northern and Eastern Provinces was forcefully taken over by the Government for establishing high security zones and for other military purposes rendering thousands of persons displaced mainly, the Tamil community. They were forcibly evicted from their lands without the Government following due procedure or taking over the lands. At the end of the war not all communities were allowed to return to their lands and many families are still internally displaced. As of February 2015 the Government estimated 6,000 Acres of land to be still in the occupation of the military in Palaly alone. Many areas are still declared as military zones or were allocated for alternative use by the previous government. A significant number of the displaced communities waiting to be able to return in their original lands are from Paanama, Sampur, Valikamam and Mullikulam. After the war, the Government’s push for ‘development’ resulted in forcible acquisition of land by State and private actors, displacing thousands of vulnerable people across the country and converting the lands forcibly acquired by the State during the war for high security zones into Special Economic Zones. The traditional livelihoods of the affected families in agriculture, livestock-rearing and fisheries have been destroyed and those who are displaced are now destitute. Over 36,000 hectares of land previously controlled and used by farmers have been ‘grabbed’ according to a 2012 survey, particularly in the Moneragala, Trincomalee and Polonnaruwa districts. Many of those displaced have been living in temporary shelters for years on end and are unable to carry on their previous livelihoods. Fishers and farmers in Kalpitiya and Panama have been deprived of their lands and waters through tourism promotion zones and high security zones. Around 5,000 fisherfolk livelihoods have been severely compromised in the 14 islands in the Kalpitiya peninsula in the north-west due to the lease of 1,200 hectares of land for tourism, undermining the customary rights of the local people. Most land grabs occur through the actions or inactions of the state. Government ministries, the security forces, and statutory agencies such as the Tourism Development Authority are responsible. There are urban communities of Sinhala, Tamil and Muslim, who have been evicted and displaced in Slave Island and other areas of Colombo, for commercial, luxury residential and tourist projects. There are rural communities of Hill Country Tamils living in sub-standard housing, without legal title to estate dwellings occupied for generations, and without access to land. In the run-up to the Presidential Elections in 2015, one of the election promises made by President Sirisena was to release the lands taken over for military use. After his election as the President a large extent of the land held by the military was released and in February 2015, a Cabinet decision was taken to release a further 1,000 Acres of land in Valikamam and the 325 Acres of land in Paanama except 25 Acres on which buildings are constructed. More recently in May 2015, the President has revoked the Gazette by which over 1300 Acres of land in Sampur were taken over for development as a special zone for heavy industries. However, no steps have been taken to date to give full effect to the Cabinet decision and to release the land to the community. On the contrary, steps are being taken to prevent the communities from accessing their lands. For instance in Panama, a case has been filed in the Magistrate’s Court to prevent the community from entering their lands and an order has been obtaining preventing the community from protesting and voicing their concerns over the injustice caused to them. 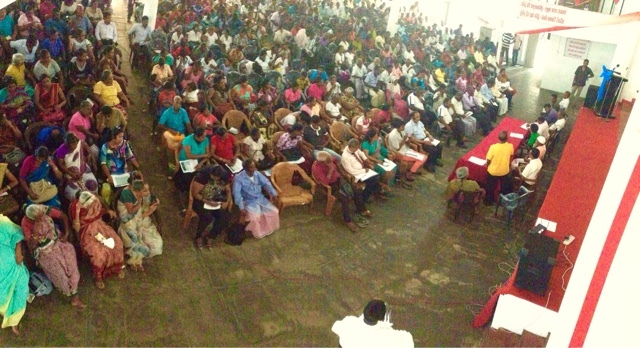 Approximately 1100 acres of land were released in Valikamam North in Jaffna peninsula by the government. However a further 5832 acres of land in KKS and Valikamam North remain under the control of the security forces. Since 2015 March, a number of IDP families were relocated in their own places such as: Valalai, Thihiddy, Mahiliddy-south, Vimamgamam, Varththalavilan, Palali-East. Though the lands were released, only a limited number of people were returned to their lands due to the lack of basic facilities. Surveys conducted by Praja Abhilasha (PA) and National Fisheries solidarity Movement (NAFSO) in September 2015 have found the existence of 43 IDP camps in Jaffna Peninsula. In May 2015, the President issued a Gazette revoking a previous Gazette notification issued in 2012 which demarcated a specified zone for heavy industries in Sampur. This decision was challenged in the Supreme Court and Supreme Court ordered that the Gazette notice issued in 2015 is valid. However the entirety of lands belongs to the people who were displaced have not been released. Sri Lanka is obliged by membership of the United Nations and voluntary acceptance and accession to international treaties and conventions including the Universal Declaration of Human Rights, the International Covenant on Civil and Political Rights, the International Covenant on Economic, Social and Cultural Rights and the Convention on the Elimination of All Forms of Discrimination Against Women, to respect, protect, and fulfill the rights to housing, land and property of its citizens. Securing the rights to housing, land and property is crucial to the realisation of civil, political, social and economic rights in general. The protection of the right to land and property is critical to the realisation of the right to adequate housing, as well as the right to an adequate standard of living, the right to health, the right to education, gender equality and equity, protection from violence, injury or abuse, and so on. The rights to housing, land and property include protection from forced eviction. “Forced evictions” are the “permanent or temporary removal against their will of individuals, families and/or communities from the homes and/or land which they occupy, without the provision of, and access to, appropriate forms of legal and other protection”. (7) Rural women shall enjoy equal rights with men to have access to agricultural credit and loans, marketing facilities, appropriate technology and equal treatment in land and agrarian reform as well as in land resettlement schemes. (4) No legislation may permit arbitrary evictions. The Peoples’ Alliance for Right to Land (PARL) is a voluntary coalition of environmental, social justice, human rights, and community-based organisations of women, small-scale farmers, fishers and plantation workers, and civil society activists opposed to the dispossession of the poor from their lands, fishing waters, and homes; and in solidarity with the struggles of the affected peoples. Contact Person: Mr. Herman Kumara, 10 Malwatte Road, Negombo. Email: hermankumara@gmail.com. Sri Lanka Nature Group, Uprooting People from the Land: Land Grabbing in Sri Lanka – Present Status and Trends, June 2012 at p. 6, online at https://file.ejatlas.org/docs/landgrabbinginSri_LankaEnglish.pdf. Land Grabbing and Development Induced Displacement (February 22, 2012), online at http://daccess-ods.un.org/TMP/6010735.03494263.html; and Land Issues in North and East and LLRC Recommendations (March 15, 2013), online at http://www.lawandsocietytrust.org/PDF/PARL%20LLRC%20Implementation%20Land%20North%20and%20East%20March%202013.pdf. Para. 4, General Comment No. 7 of the Committee on Economic, Social and Cultural Rights, 1997. Article 17, Universal Declaration of Human Rights 1948. Adapting Article 16 (h) of the Convention for the Elimination of All Forms of Discrimination Against Women 1979. Article 35 (7) of the Constitution of Ethiopia 1995. Adapting Article 25 (2) of the Constitution of South Africa 1996. Article 25 (3) of the Constitution of South Africa 1996. Article 25 (5) of the Constitution of South Africa 1996. Article 14 (2) (g) of the Convention for the Elimination of All Forms of Discrimination Against Women 1979.